What was once a top 20 coin with a market cap above $2.5 billion, has now become the object of a FBI nationwide search. One of the most unreasonably hyped projects of 2017 seems to be under investigation. Judging from a news update from the Cleveland Field Office of the FBI, the Bitconnect story might see further judiciary chapters. The Federal Bureau of Investigations is chasing after investors who were affected by the initial coin offering of the Bitconnect coin (BCC), “orchestrated” (such is the wording of the Bureau) by the company back in November 2016. The FBI notes on their news release that for the majority of BCC’s existence, it was only possible to purchase, trade or sell it through the exchange hosted by Bitconnect. Another characteristic of the project that the Bureau feels necessary to highlight is the tiered-investment system that promised investors 10 per cent monthly returns on their initial deposit, much in the form of a Ponzi scheme. 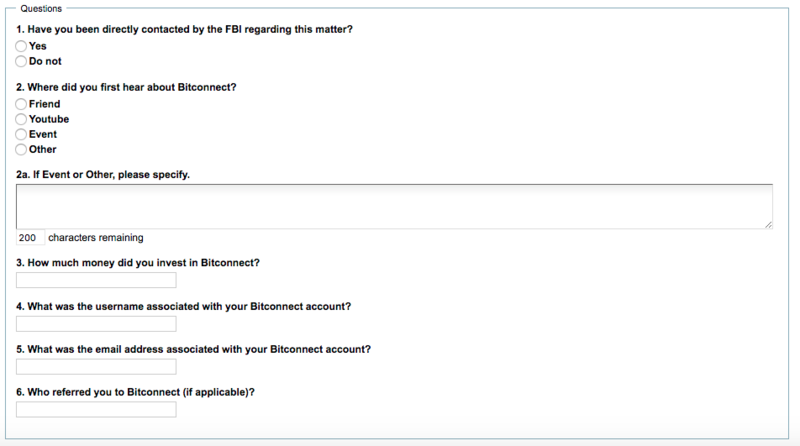 FBI should also search for Bitstamp victims. There are a lot of them.